Basic reason my arm angle dropped was physically, my arm would not allow me to throw from the top any longer. Not sure if this was a resultant of years of pitching or a physiological issue. I have never been on the DL and I have worked through some arm issues in my life where I've had to adapt to continue pitching. As a result of my arm angle changing, I've had to adopt from a hard curveball to a slider to be successful. Never a extremely hard thrower ( 89-91), I had to change my whole approach to pitching to be successful. Hitting my spot is extremely important to my approach and the drop in my arm angle inadvertently hides the ball where batters do not pick up the ball as quickly or recognize the rotation. 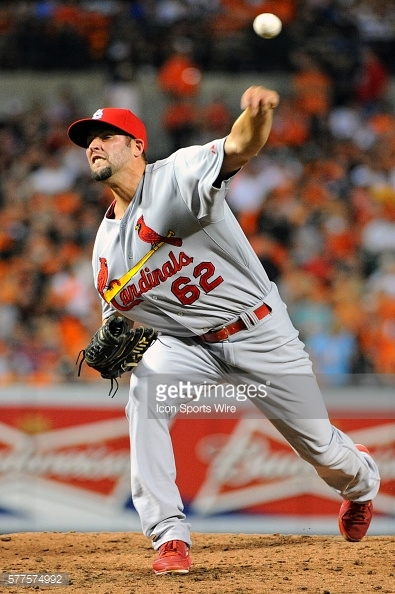 I believe the arm angle and my sinker give me my successes. Dropping down earlier my career was really not an option. I learned from a young age to mechanically throw the ball from the top but years of use have physically directed me to throw from the angle. I complement my sinker with my change up. Again, because my velocity sits at 88 to 91 my slider and changeup and their location and the arm angle are key. My approach to right-handers is to throw from my angle a sinker that runs away from them and just the opposite for lefties. I use my arm angle and sinker to bring the ball into them. I am not a strikeout pitcher, so my ground ball to fly out ratio is extremely important. Because of the sinker and because of the arm angle, I am always amongst the top pitchers in my league in double play balls. This is my advantage to pitching with my arm angle.